The Ameo is the best selling vehicle carrying the Volkswagen emblem on it in India. The car is also VW’s first-ever sub-4 meter sedan in the world. The Ameo is one of the best lookers in the segment with a very proportionate body. Volkswagen has made ABS and dual airbags as standard across all the variants of the Ameo. Volkswagen also offers a lot of features such as cruise control, rain sensing wipers, power assist on all four windows, anti-pinch and one touch operation on all the four windows. There is also a touch-sensitive infotainment system with Mirror Link. The car is powered by 1.2-litre 3-cylinder MPI petrol engine that produces a maximum of 74 BHP-110 Nm of torque. The diesel engine comes with 110 BHP 1.5-litre engine. Volkswagen also offers DSG transmission with the diesel engine option, making it the only one in the segment to do so. The Ameo is the cheapest VW you can buy in India, and the car starts at 5.48 lakh rupees. Yes, the Ameo is even cheaper than the Polo hatchback. The Hyundai Grand i10 is the new generation i10 in the international markets, but in India, Hyundai sells it as the Grand i10 to differentiate between the two. The Grand i10 offers a lot of space in the segment – the rear seats of the Grand i10 are more spacious than the Swift. The Grand i10 also offers rear AC vents, a first in the segment. Prices of the Grand i10 start lower than that of the Maruti Swift, at 4.69 lakh rupees. The Hyundai Grand i10 also offers class-leading features with the Android Auto, and the Apple CarPlay enabled infotainment system. Android Auto, and the Apple CarPlay enabled infotainment system are now offered on the top-end models. Hyundai sells the Grand i1o with 2 engine options – a 1.2-litre diesel engine that puts out of 73 Bhp, and 1.2-litre petrol engine that churns out a maximum of 82 Bhp. The Kwid changed the fortunes for the French manufacturer in India. It became the first car to touch the 5 figure sales in a month for Renault, and the sales of the vehicle have been keeping steady since then. The reason behind the success of the Kwid is the sheer value it brings to the table. Prices start at 2.8 lakh rupees, and for this kind of money, the Kwid offers more than competition, in terms of space, styling and features. The Kwid’s SUV-inspired design makes it a butch looker, and gives it good street presence. The car also comes with two petrol engine options. There is the 799 cc, 3-cylinder engine that generates a maximum of 53 BHP and 72 Nm. There is also a 999 cc engine that produces a maximum power of 67 BHP and 91 Nm. Renault also provides an AMT transmission with the 1.0-litre engine. That’s not all, Kwid also comes with segment-first features like touch-sensitive infotainment system that offers navigation, making it an attractive buy. The Tata Tiago has became quite a successful vehicle in its segment. The Tiago is the first car from Tata that was launched after the company’s announcement of changing the brand’s image. Tata Tiago offers premium looks, nice interiors and plenty of space. Also, the vehicle is loaded with features Connectnext infotainment system that offers navigation. The car starts from 3.39 lakh rupees, making it cheaper than both the Celerio and WagonR. The Tiago also comes with powerful engine options like 1.2-litre 84 BHP-114 Nm petrol engine that produces more power than the rivals like Celerio. A diesel engine is also on offer. The Tiago gets a 240 liter boot, which is the largest in the segment. Tiago offers a lot of features that makes it as good as the cars from one segment above, and people love the value for money that this Tata offers. The India’s cheapest car also offers a lot of features making it a good value for money product. The Tata Nano starts at a price of Rs. 2.06 lakh. The higher end variants are priced at only Rs. 3.03 lakh and it comes with all the features that you will ever need in a car. The Nano offers AMT, infotainment with Bluetooth and AC, at a price that the competition simply can’t match. 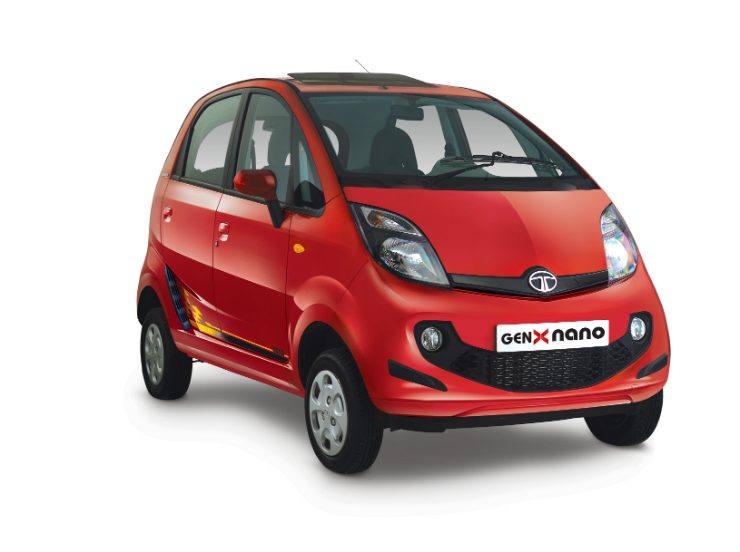 In terms of sheer value, there’s nothing better than the Nano in the Indian market currently.